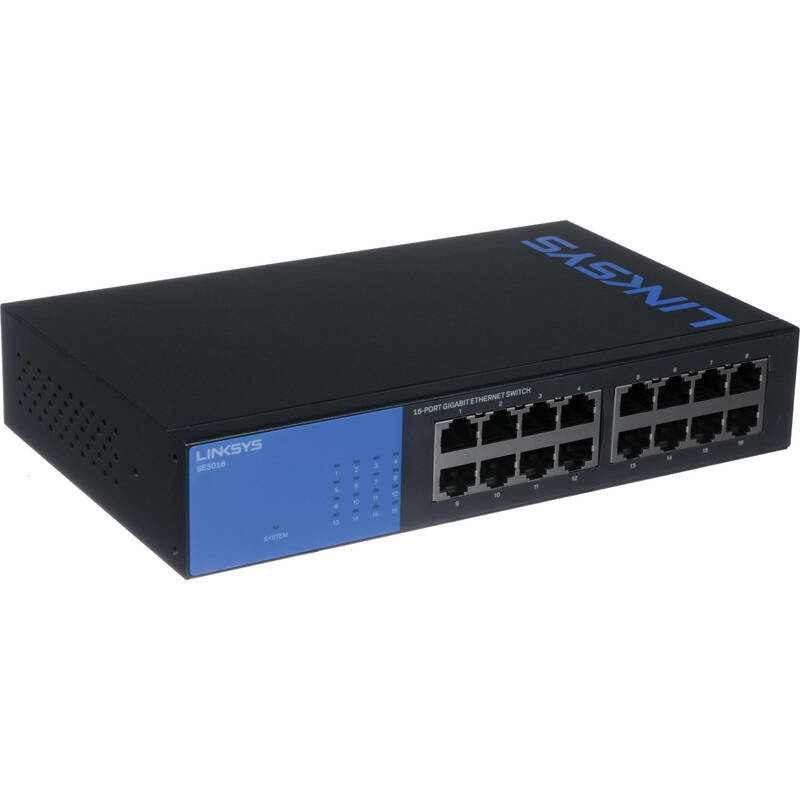 Expand the switching capacity of your home or office wired network with the SE3016 16-Port Gigabit Ethernet Switch from Linksys. Designed to be rack mounted, the unmanaged SE3016 switch comes equipped with 16 front-facing Gigabit Ethernet ports, ideal for connecting Ethernet-enabled computers and devices to your network. The plug-and-play SE3016 supports a variety of networking standards, including 802.3u/x/ab/az, while support for the 802.1p quality-of-service standard can help prioritize video and voice traffic. The SE3016's power-saving features are designed to reduce power usage for unused ports and short cable runs. Integrated LED lights display the the switch's power and networking status. The LED indicators can be turned off manually to conserve power. Box Dimensions (LxWxH) 12.9 x 8.9 x 2.8"
SE3016 16-Port Gigabit Ethernet Switch is rated 4.4 out of 5 by 9. Rated 5 out of 5 by indymil from Good investment I've only had this about a week, but am very satisfied with it's performance. I had several smaller switches at different locations. I'm a firm believer in wired connections whenever possible (have a basement to route the network cables). This lets me put most of my cables in one device (which I believe helps overall performance). It's essentially plug and play ... set up went flawlessly. Definitely recommend this switch. I prefer to use brand name devices whenever possible. Have bought several LINKSYS products and have never been disappointed. Rated 5 out of 5 by Johanea from SE3016 switch I had to import one since not sold yet in my country using Amazon. Hooked it up to my network consisting of 13 devices. Flawless and no issues whatsoever. Only thing I had to do was to change the plug from American standard to own standard on the power supply cord. It does perform as expected and I do recommend this switch. Plug and play, enough said. Rated 5 out of 5 by Anonymous from SE3016 16-Port Gigabit Ethernet Switch by Linksys Small form factor for a 16 port switch. Direct plug in power cord, no wall transformer needed. Metal case. Silent must not need a fan with the metal case. Rated 5 out of 5 by Billy from whole home Lit up the house like a christmas tree. every room wired. Rated 1 out of 5 by Drz1525 from DOA Bought this switch when an old 8 port went bqad. Out of the box not working. Big waste of diagnostic time. Rated 5 out of 5 by Anonymous from Excellent, fast, and plug & play With multiple networks, I needed a fast and reliable switch. This product delivers exactly as described. does it have auto negotiate capability ? Nope! This is not an intelligent switch. Nevertheless, it works like a champ!